‘YEH HAI LOLLIPOP’ IS A SENSIBLE COMEDY! 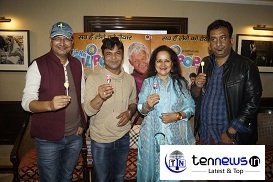 The starcast of the upcoming hindi film ‘Yeh Hai Lollipop’ Rajpal Yadav, Himani Shivpuri, Hemant Pandey and Director Manoj Sharma promoted their film in Delhi’s PVR Plaza. The film is based on a flop writer who is writing a story in a mall. Om puri plays the character of the writer where Himani Shivpuri plays his wife in the film. The film is a combination of drama, thrill, romance, humor and will be showcasing the growing mall culture in India. Himani Shivpuri said the film is a serious comedy not like the comedy that we are seeing in the movies today. These days in the name of comedy they show vulgarity and cross their limits. Produced by Harshal Bhadane the film is slated for a release on 11th November. 'YEH HAI LOLLIPOP' IS A SENSIBLE COMEDY! EPL: Middlesbrough hold Manchester City to 1-1 draw, Burnley defeat Crystal Palace 3-2, West Ham-Stoke City play out 1-1 draw.